AJ Motors and Son Ltd have handed over a special sponsor kit van to Tranmere Rovers ahead of the new season. 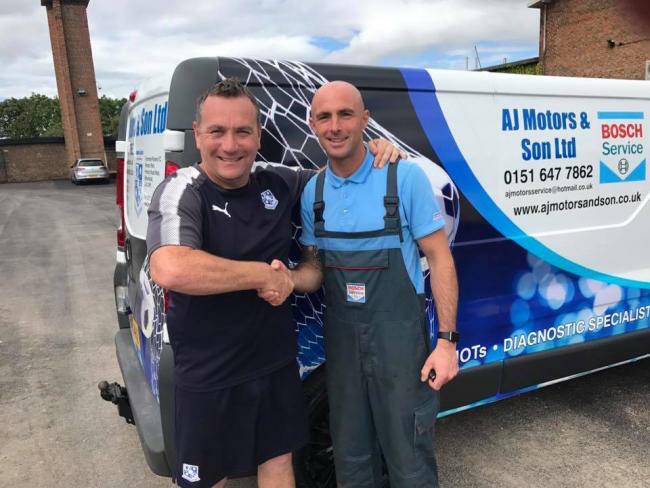 AJ Motors have had a fleet management contract with the company for around 15 years, wanted to give something back to the club and show their support for the upcoming season. Steve Jones (co-owner) said: “My brother Mikey started out with Tranmere when he was starting his footballing career, he made one first team performance before moving on. “So we’ve had a longstanding relationship with the club. “We’ve basically been doing contract vans with the club for around 10 or 15 years, they approached us asking for a kit van and of course we offered. “It’s all about giving something back to them, they’ve done a lot for us. “It was brilliant to meet Micky Mellon and all of the back room staff, who are doing such a fantastic job.